Director of Likud Anglos Daniel Tauber filed a petition in the Likud’s internal court following the cancellation of elections for Israeli (Likud) representatives to the World Likud Convention. Such elections were required by the Likud Constitution. 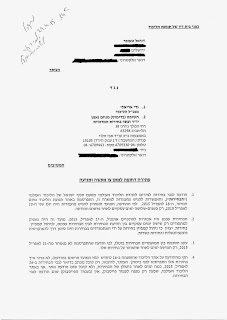 Tauber claims that the manner in which the elections were conducted and ultimately cancelled violated Likud members' rights under the party constitution. READ THE ARTICLE IN LIKUDNIK (HEBREW). Tauber is himself a member of the Likud Central Committee which was to elect the representatives. The Likud Party’s representatives in the Convention choose World Likud’s representatives to the World Zionist Congress which controls large amounts of funding spent in Israel and abroad. The Convention, including its delegates outside of Israel, also elects the chairman of World Likud, currently Minister Danny Danon. The elections were cancelled due to the agreement of the factions competing in the elections. The elections, however, were announced on April 16th, only a few days before the deadline to file candidacy, April 19th, and it is not clear what notice was provided for the elections. Tauber claims that the incredibly short deadlines combined with the insufficient notice, gave a significant advantage to the factions that knew about the elections in advance, which Tauber asserts, is likely all of them. Ordinary members without insider knowledge were left in the dark, Tauber claims. In his petition, Tauber cited past instances of failure to properly conduct votes and elections saying each instance was a step down a slippery slope. "With these elections that were not held, we've come very close to the end of the slope, if not the end of it," he asserted. Tauber has for years opposed moves to restrict or cancel elections in the Likud. Tauber lobbied Likud Members of Knesset against proposals to cancel Likud primaries in 2012; opposed the Likud’s merger with Yisrael Beitenu on the grounds that Yisrael Beitenu candidates were not chosen democratically; has spoken against cancellation of primaries on numerous occasions; and has proposed a clause to the Likud constitution entrenching primaries and a number of other amendments to strengthen the democratic process in the Likud. The proposals to cancel primaries and have the Central Committee choose Likud members of Knesset is currently being promoted by powerful Central Committee members, including newly elected Likud Members of Knesset David Amsalem. 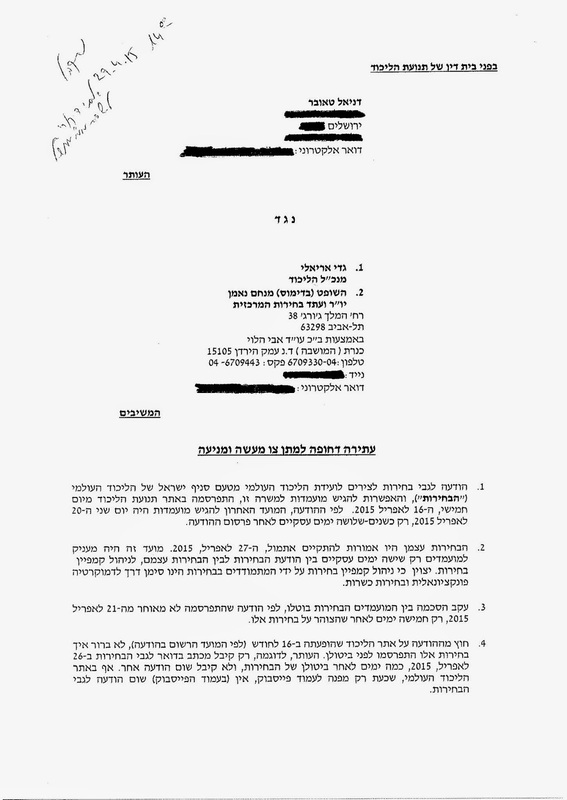 Tauber’s original petition was rejected by the Likud’s internal court, but Tauber filed a request for a rehearing, as permitted by the Likud Constitution. If the internal court rejects the request, Tauber’s only option would be to file a petition in court outside of the party.